Throughout the year Velo Club Vitesse holds several events and organised rides. Club Sunday Run (9:30am Every Sunday @ Aldi in Irvine). The regular club run leaves every Sunday morning at 9:30am from Aldi on East Road, Irvine. The ride is thirty to forty miles at a steady pace. No riders are left behind and the ride regroups at key points along the way. Existing and prospective riders are all welcome and should come prepared with a basic repair kit (spare tubes, pump, allan keys and tyre irons). Thursday Night Individual Time Trial (6:45pm every Thursday at the old Lylestone School House outside Kilwinning). This is an individual time trial over the undulating 10.6 mile Blair Road circuit. Riders can test themselves against the clock over a lap of the challenging course. Times are recorded and dished out at the end of the session. Racing starts at 7pm. Tuesday Night Open Group APR Training (6:45pm every Tuesday at the old BMX track on Marine Drive, Irvine). Starting on Marine Drive, this is rider ability group training for several laps of a course that comes with both fast sections and sharp climbs. Tuesday nights are not confined to member’s only. This is an open road bike session to which any riders can come along, break into groups and train together. No times – just good old fashioned bike riding! Friday Night Ice Cream runs (6:45pm every Friday from the Green Bridge at Irvine’s Low Green). 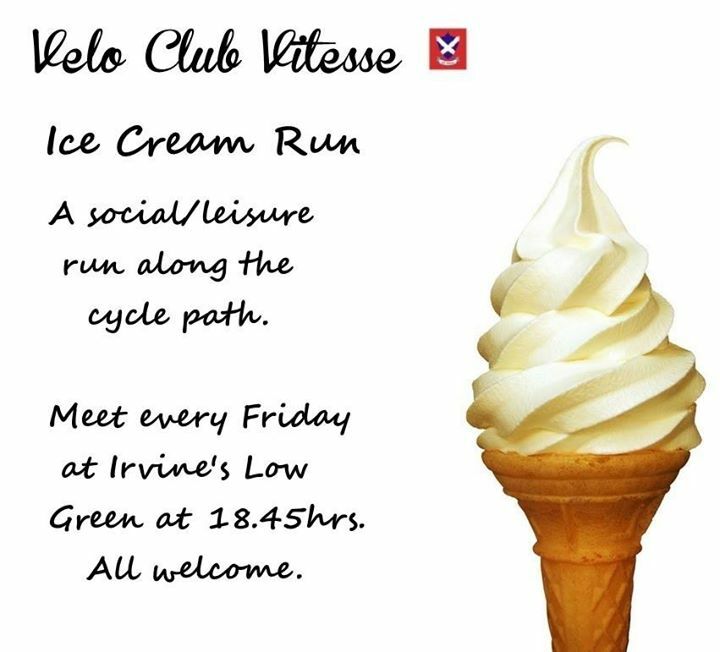 The weekend gets off to a relaxing start with Velo Club Vitesse’ ice-cream run. This is a family friendly run starting at 6:45pm at the green bridge at Irvine’s Low Green. Riders of all abilities with any type of bike are welcome for a run that sticks to cycle paths and maintains an easy and comfortable pace. The evening is open to anyone, not just VCV members and makes a stop half through for chips or ice-cream (depending on the weather). A number of planned away days run throughout the cycling season. These are further afield and get riders out to great cycling destinations that still sit on our doorstep in Southwest Scotland. For up to date information on the week’s upcoming events, visit the club’s Facebook and Twitter pages.